So you have no problem taking a 4-5 hour trip to see your favorite team in another ballpark, right? For fans whose home ballparks are outrageously expensive to visit, like Cubs and Red Sox fans, it’s a popular thing. Much of downtown Baltimore’s hospitality industry is dependent on Red Sox and Yankees fans that visit Camden Yards 21 times a year. 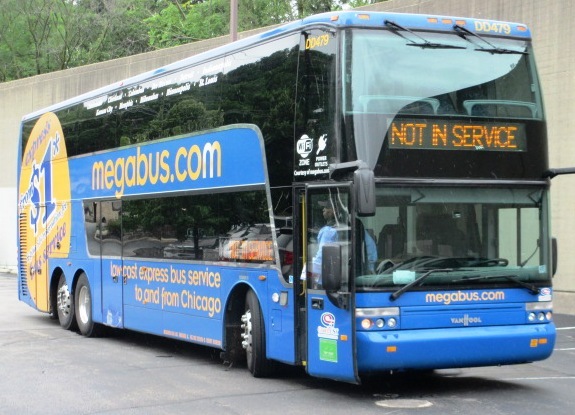 If you want to save a boatload of money on such trips, try a Megabus. Just saying, when they’re in service they’re great. Megabus is a luxury bus service available now in about 50 cities in the U.S. and Canada (and in the U.K. even, but anywhere they don’t play baseball doesn’t matter). They have single and double decker buses, all of which have Wi-Fi and free plug-ins. And they do it all for a ridiculous price, sometimes as low as $1. You have to book such deals well ahead of time, but that’s worth the trouble. Megabus operates from popular transportation hubs in large cities, so your only part of it is getting to the transportation center. In my home town of Philadelphia, that would be the 30th Street Amtrak station. With most ballparks in downtown areas these days and easily reachable by public transit, you should be able to leave the car at home and save a ton. I’ve used Megabus a few times with great results, but my favorite example is when I used one from NYC to Boston…for just $2.50 round trip. I found a couple of $1 fares and the fee was just 50 cents. Between gas and tolls, driving that distance would cost at least $50—assuming you are using your own car. And that’s not figuring in the aggravation of the traffic, which is always bad in Connecticut and usually bad near New York and Philadelphia. Not dealing with that is certainly worth a few extra bucks. Did I mention the price of parking in Boston? Four hours is a long time to ride on a bus, but Megabuses are clean, air-conditioned and comfortable, with free Wi-Fi to keep you busy. You can take care of all that other business you are too busy driving to do, or you can go onto the upper level and enjoy the panoramic view. You’re allowed one piece of luggage and a carry-on bag, which for a weekend trip should be plenty. He may be small, but he looks friendly enough. 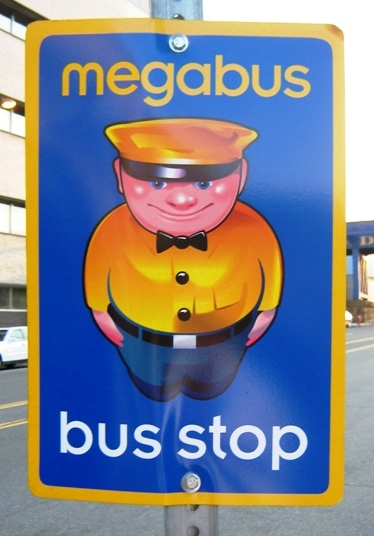 Megabus covers most major cities in the U.S. and Canada. In most cities (not all, but most) they’ll drop you off near a public transportation hub that will get you anywhere else in the city in short order, certainly to the local ballpark. It isn’t perfect, according to some reviews I’ve read…sometimes buses are late (honestly…is there a bus service that’s always on time? ), and a few people have complained that the Wi-Fi doesn’t always work. But I personally have never had a problem with them, and to get from New York to Boston and back for practically nothing? I’ll take it.